I have something to admit- this is the first Rick Riordan book I have ever read. Not sure why? Thus, I have nothing to compare it to when it comes to his other series. With that being said- I really enjoyed reading Magnus Chase and the Gods of Asgard. 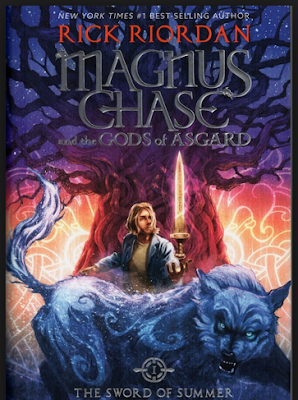 It is based on Norse mythology and it is the first book of Rick Riordan's trilogy. Who wouldn't love a good old Viking tale?! The main character is sixteen year old Magnus who has been living on the streets of Boston since his mother's death. He soon discovers that he is the son of a Norse god and his adventure begins (kinda ends too) You need to read the book :) I don't want to give too much away. Riordan integrates Thor, Loki, and Odin into his story with some hilarious scenes. I didn't know Riordan was such a funny and witty writer. I think students would be motivated to read since Marvel has made some of these characters so popular. This book never has a dull moment with humor, action, and mythology to keep any reader entertained. 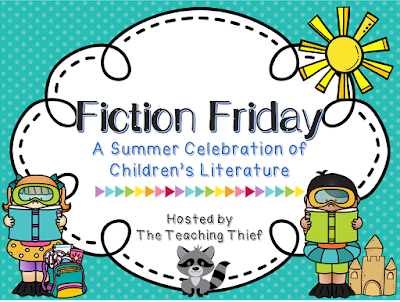 You can check out other fab fiction Friday books to read and share with your class at The Teaching Thief. I realized that one thing that I really missed in 6th grade was using picture books to teach writing. One of the best things I did this summer was to dedicate some time to finding new picture books to use the first week of school The quality of picture books is amazing! I found many of the books to be relevant to the age group I teach. 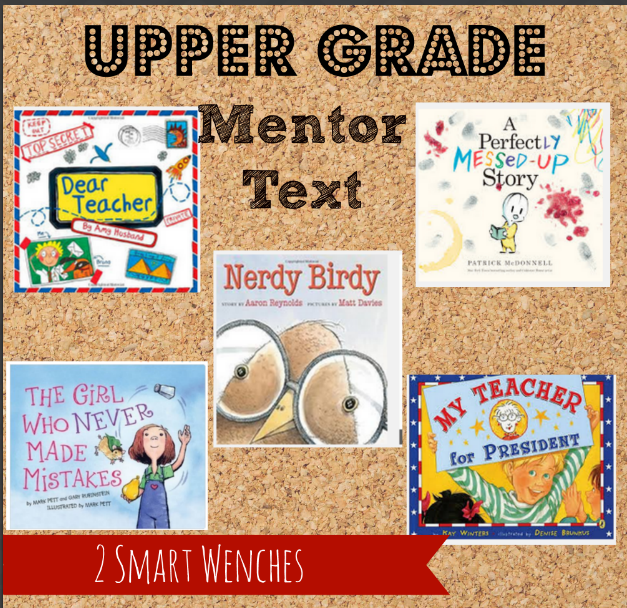 These books have a universal theme that students can relate to and they lend themselves to some great class discussion. Why groundbreaking? Well, these activities are meant to help my students break ground to becoming better writers. You can check out my 5-day series of using picture books to get students engaged and excited to write. Click on the pics if you want to check them out a little closer. 1. Scotch Tape Dispenser- My happy place is at home gardening. I love caring for my plantsies and having them thrive. Now, every time I grab a piece of tape I'll think of them. Heaven! 3. 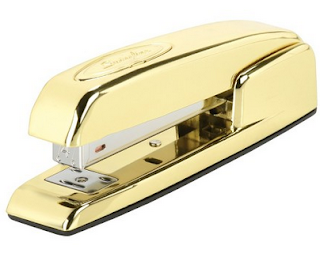 Nate Berkus gold stapler truly does make one smile :) Beautiful color, staples great, and looks expensive, but isn't. Now stapling will be a joy. Bring on the packets. 4. Mr. Sketch... need I say more? When I grade papers I enjoy using colored pens and in my mind that equals students enjoying reading my comments. 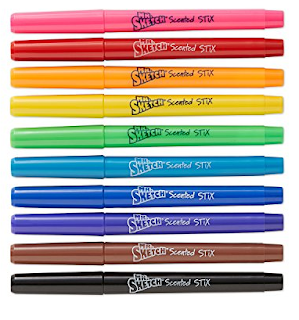 Now I can grade those papers with colors that pop and a yummy smell. Totally worth the purchase. 5. I'm an obsessed fan of Post its. 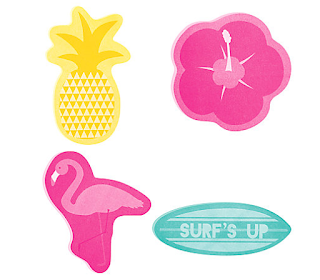 No, not sticky notes- Post its. 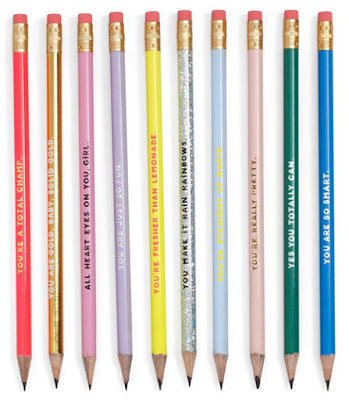 I think they stick the best. Then, I saw this tropical number I was over the moon. Look a pink flamingo? I'll be sending lots of notes to the teacher next door (it's my hubby- he is in room 17 and I'm in room 18) He won't mind when he sees how great they are. 6. 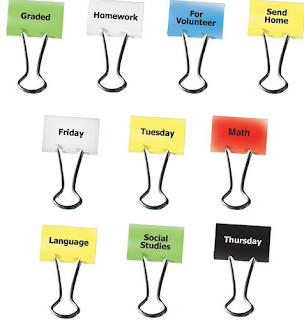 Top Notch Teacher Clips- What I love about these is that they are labeled and seem as sturdy as the plain black ones. They come is small packs or a pack of 18 of different labels. Now, I can clip away and be organized in style. 7. 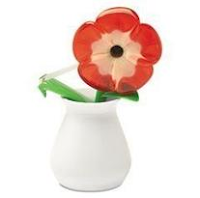 When I found these Pen Pal Flexible pen holders my heart leaped. No more trying to find a pen when I doing formative assessments, recess duty, attendance, and/or writing a nurse note. I can put a Pen Pal anywhere because of the adhesive on the back. Just peel and stick. 8. Yes water is S'well (Did you know we are suppose to drink about half an ounce of water for each pound you weigh?) Now there will be no more excuses not to drink that water. Bonus! 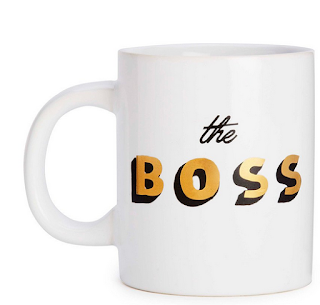 Because we should all start our day feeling like, "We got this!" Do you have any "Fun Haves?' I'd love to hear about them. "The kids need to head home exhausted because of all the thinking they have been doing- not you (teacher)!" OMGoodness!...there are days when I have done so much thinking throughout the day that I just want to get home and veg in front of the T.V. Since my epiphany moment, I have been focused on finding strategies, tools, anything that will help my students feel empowered about their learning and be more responsible and aware of their learning. Obviously, let's assume that I have taught the lessons, scaffold, used concrete to make abstract learning more accessible, differentiated, provided small group review and enrichment, created a visual chart with the students for reference, and who knows what else! Now, it's time to remove some of the tools and see what the kids can do on their own... crickets... they're stuck. D.I.Y. 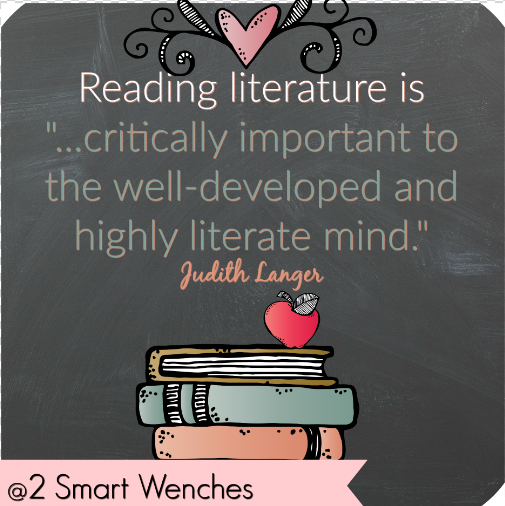 Literacy by Kate and Maggie Roberts is a beneficial read because it offers practical, easy to use visual tools that create D.I.Y. 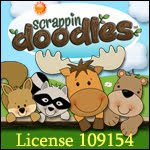 Learners. So no need to buy anything- remember it's D.I.Y. 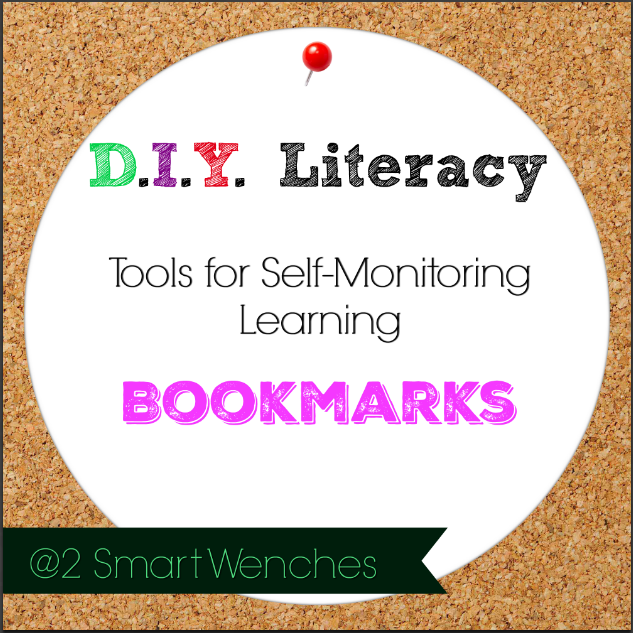 Today- let's talk Bookmarks. 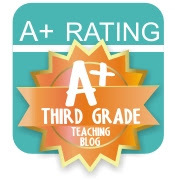 K. and M. Roberts share, "Bookmarks allow students to personalize and keep close tabs on the work they are practicing in reading and writing." But people, I believe this half sheet of paper is a tool you can use in all subjects. K. and M. Roberts offer a great suggestion of using bookmarks as a way to create a personalized list of what to remember. Now students need to decide what helps them understand the skill. 1. All resources are gathered (charts, notebooks, handouts) and made accessible to students. 2. Together look over resources and decide what is most helpful to them. Model making the bookmark if it is the first time. 3. Students are now ready to create their own bookmark. 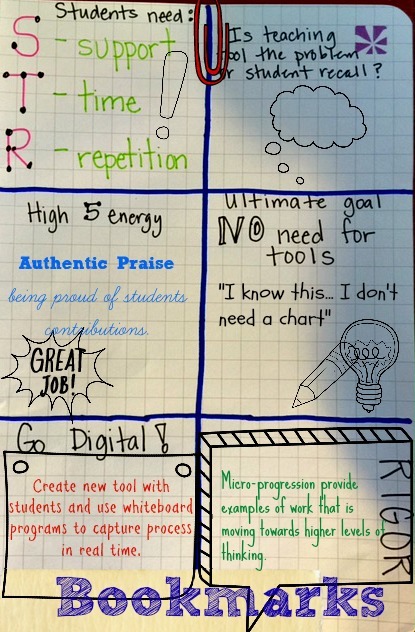 Students use half-sheet of paper, pens, colored pencils, icons, and drawings to serve as a reference. Simple, yet powerful! Here is my go at it with what I want to remember for chapter 3 &4. 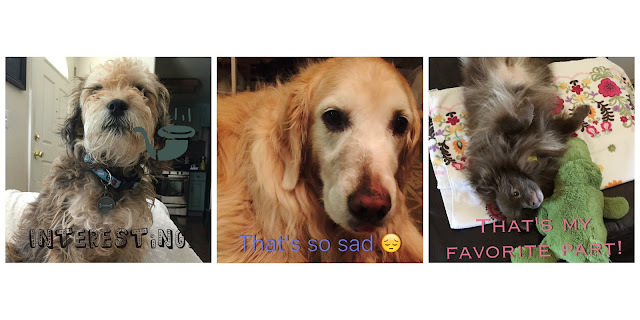 Thank you Amanda from The Teaching Thief for inspiring this doggy edition post! Meet my personal reading support team. They have approved the following review. This was a beautiful story told from the main character's point of view. She is an eleven- year -old girl named Rose. Rose is a high-functioning autistic girl that comes from a single parent home. She is being raised by her father who does very little to understand her. Rose loves homonyms. She can tell a story and every time (thyme) she hears (here's) a new (knew, gnu) homonym she must write (right, rite, wright) it down. Rose is also obsessed with rules. Rose isn't very liked at school because she tends to point out when other kids and adults break rules. Ann M. Martin does an excellent job integrating Rose's love of homonyms and rules with the story line. It adds to who Rose is. Rose has a dog named Rain (Reign) who is one of her few sources of unconditional love. Rain is Rose's companion and the one who ultimately helps her connect to her emotions. Rain gets lost when Rose's dad lets her out during a storm. When Rain is finally found the plot takes an unexpected turn. Rose knows she has to do the right thing (it's a rule). Overall thoughts: This book didn't seem to be about autism or trying to say this is what an autistic child thinks or feels. It is a book about family, fears, hopes, loneliness, and all those emotions that make kids and adults want to read more. Teaching reading using fiction is truly my favorite part of the school day. There are days when reading class feels magical and the level of thinking and participation are what teachers dream of. Kelly Gallagher, author of In the Best Interest of Students shares that the thinking involved in reading literary works is different than when reading other disciplines. Students learn to become creative thinkers, explore the possibilities, connect, find solutions, and desire vision. How fantastic is that? Goals 5-7 in The Reading Strategies Book are dedicated to reading comprehension using fiction. Can I say these are my favorite chapters?! Serravallo includes tons of "oldies but goodies" and new strategies that any teacher should have in their repertoire. AND Serravallo has put them all together in this recipe book style. There are 28 strategies on plot alone. Gasp! One that I will definitely use is Plotting Flashback on a Timeline. My students have a tendency to overlook flashbacks in their reading and recognize the importance it has to a story and characters development. Ask them: What does the flashback tell us about the character? Ask them:Where will we place that on your timeline? Coming Up: A strategy (new to me) that will help my students self-monitor their own learning. Plus Friday Fiction...YAY! 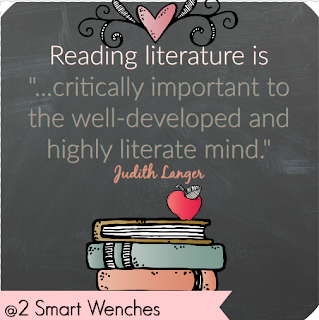 I have actually woken up in the middle of the night pondering the use of nonfiction cues to build reading fluency. Why? Because some of my students struggle to grasp understanding of nonfiction text due to fluency. Phrasing is a strategy that is easy to begin incorporating in my reading program. Serravallo shares that one can use high frequency phrasing as a warm-up. Students should practice reading the phrases in one breadth and reminding them that when they know a word or two they will know the next words that go together. I plan on choosing 5 to 10 phrases a week and reading them together as a daily routine. 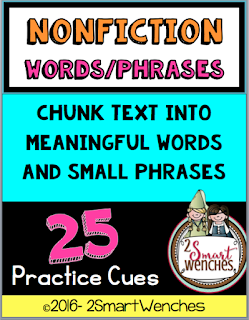 Thus far, I have compiled a list of 25 words/phrases used frequently in nonfiction text. Feel free and download and use in your class. Do you have other nonfiction words/phrases you think I need to add? Welcome! I'm Martha! 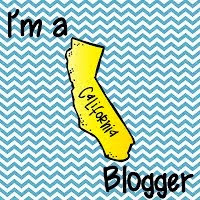 I'm a sixth grade teacher in Southern California. Together, Wendie and I have been teaching for nearly fifty years and we're still learning! 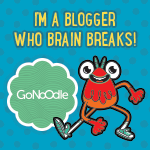 We are looking forward to sharing classroom tips, teaching ideas, and upper elementary grade resources.